1) What types of “Queue Management” system banks can purchase to implement Queue Management System? Stand alone “Queue Management” system. This kind of system does not use banks computers for implementing the “QueueManagement” system. PC software “Queue Management” system.This kind of system uses banks computers for implementing the “Queue Management” system. We have the robust Stand alone “Queue Management” system .we insists that banks officials to go through advantages that are provided by our system as mentioned below. Our product is stand alone, means that our product does not make data communication connection (link) to any of banks IT infrastructure (computer Servers/terminals). Since our product has no connectivity to banking computer infra-structure making the idea choice offering 100 % protection against cyber threats through our product. 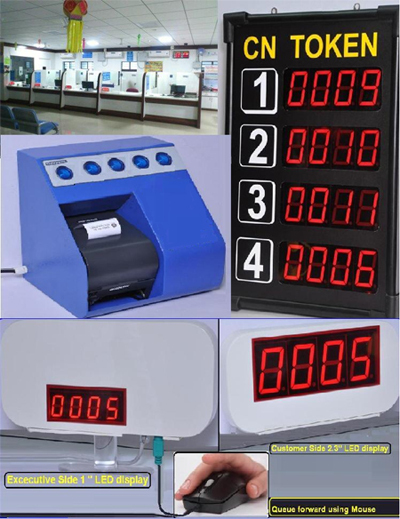 Software “Queue Management” system which is installed on PCs and operated through banks terminals and network infrastructure. This kind of system may be perfect breading ground to various “cyber threats and also is primary point of entry that an attacker may attempt to use to gain access to the Banking computer system or details. So in our opinion bank should not comprise security of vital information of valued bank customers. May develop software which is not tested to avoid security breach. May have hired employees (software engineers) without proper verification who may introduce hidden programs capable of security breach. May contract 3rd parties to develop software who are least bothered about security breach. Virus activity threats at time of installation or during software update which also concern with security breach. Technical persons of vendor may access bank data during installation and service resulting again security breach. Our product is classified as Stand alone “Queue Management” system and shall function in event of network failure of banking infrastructure making it robust system. Without depending on the banks IT department our technical team shall be able to resolve any concerns related to “Queue Management” so that system functions smoothly. But with Software “Queue Management” system there is blame game between bank IT Department and PC software “Queue Management” system vendor with respect to failure ultimately resulting in discarding “Queue Management” system in totality. 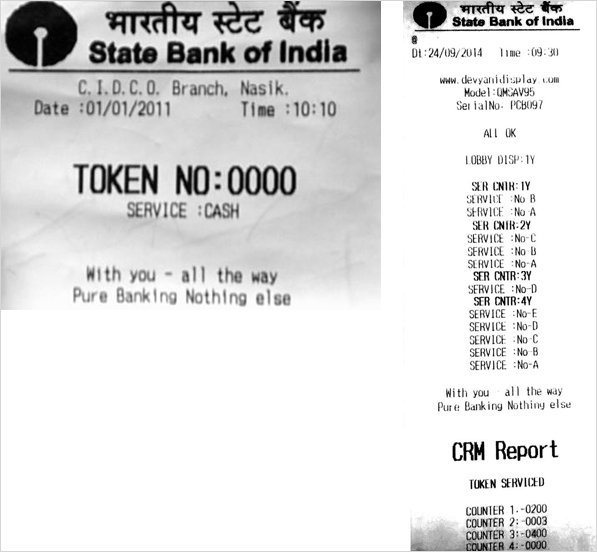 Simple operation of system resulting in operation even by support staffs, to who banks official may assign simple task form distribution or collection., but at the same time want to prohibit access to banks terminal (computer). Lobby area near the entrance a token dispenser shall be place, after obtaining the token the visitor/customer shall wait in the lobby. 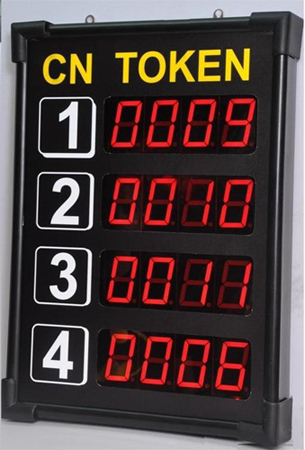 An elegant LED display shall indicate current serving token number. The queue management system shall alert the customer whenever the serving token number is changed/updated. 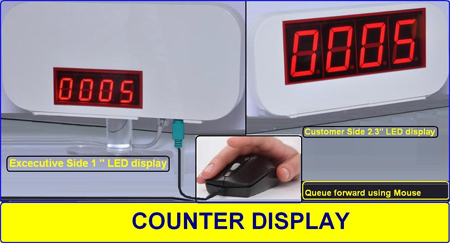 Each serving counter executive shall have a “Serving Counter Control unit” with standards PS/2 mouse the executive shall press the mouse button to move the queue forward. Kiosk shall contain buttons which the customer has to press to obtain Token. The Kiosk shall contain a thermal printer to print token. Setup requirements for the Queue Management System to be arranged by user. Queue Management should be connected to 230V AC power with suitable backup supply in case of power failure to avoid damage to the system and avoid data loss. Estimated power requirement by system is 100Watts. Thermal Printer paper needs to be installed manually if exhausted.